Come to the Balkans with your hearts open and a big smile on your face! High in the mountains, under the stars at the festival of the blueberries at the Ambarica hut, we will be there, Chamber Ensemble “Silhouettes”. 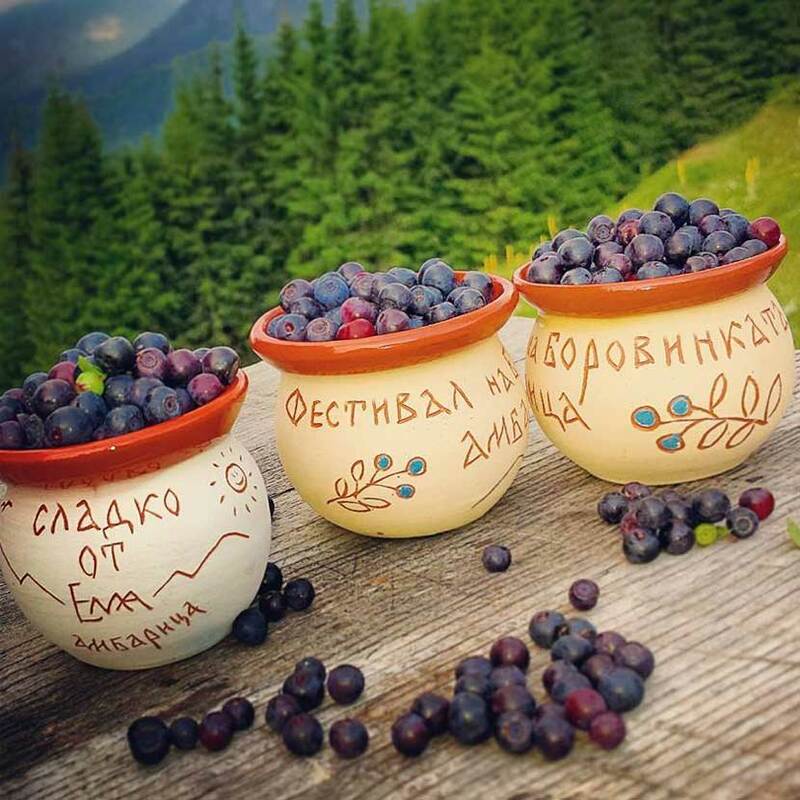 Besides admiring the beautiful view and taking part in the blueberries games, we will give the sound of classical music to the mountain hills. Meet us on the 30th of July (Saturday) on the meadow in front of the hut, exactly at 15:30. Join the event at Festival's Facebook page. 11th March (Friday) 2016 г. 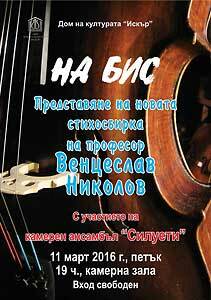 On March 11 (Friday) at 19.00 in the chamber hall of the House of Culture "Iskar" prof. Ventseslav Nikolov (cello) together with Chamber Ensemble "Silhouettes" gave a concert which included miniatures by J. S. Bach, G. Fr. Handel, G. Faure, P. I. Tchaikovsky, S. Rachmaninov, B. Bartok etc. 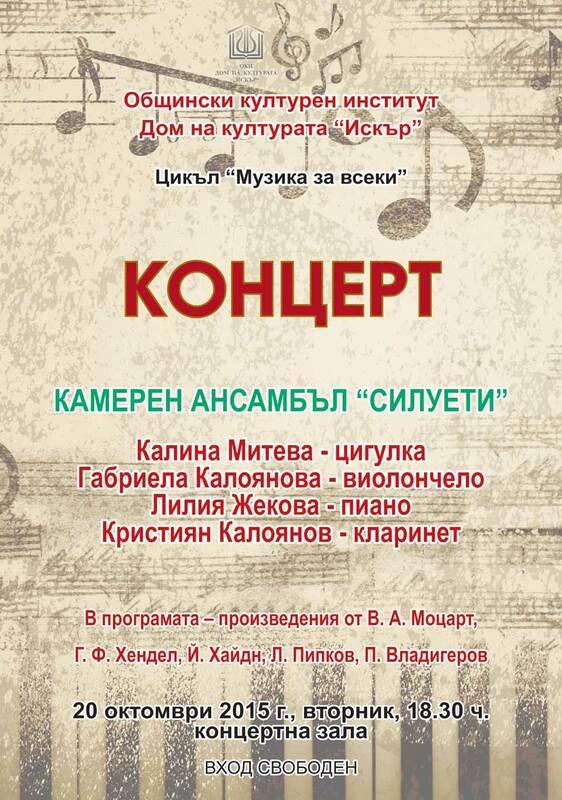 During the concert V. Nikolov presented his book of poetry "Encore". Transport: metro to metrostation „Iskarsko shosse”, trams 20 and 23, busses 604 and 88. Join the event at our Facebook page. in the "Slaveykov" Hall of the French Institute, "Slaveykov" Square No.3. The concert was held on December 21 at 19 o'clock. Watch the event online at Streamer.bg. 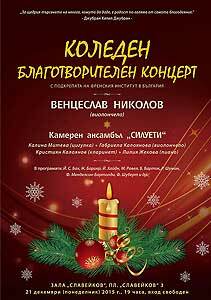 Two concerts of Chamber ensemble "Silhouettes"
The musicians will also participate in the festival’s final concert on 29th of November 2015 at 19:30 in the Great Hall of BAS, under the headline "Life after the end", together with Duo "Collage". In this concert Chamber ensemble "Silhouettes" will perform "Quartet for the end of time" (Quatuor pour la fin du temps) by Olivier Messiaen, Duo "Collage" - Francis Poulenc's monoopera in one act "The human voice". 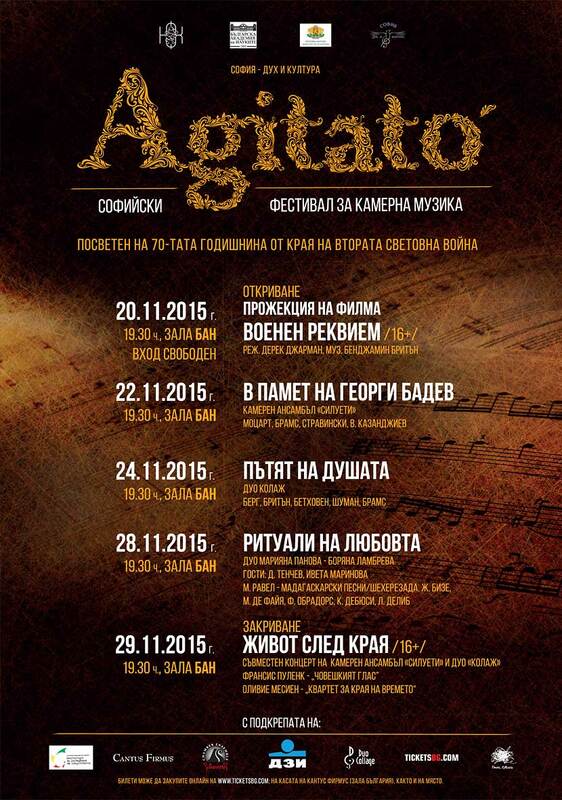 Agitato’- Sofia chamber music festival is an event that is especially directed to the art of chamber music. People familiar with the music terminology know that agitato from Italian means elated, exited. 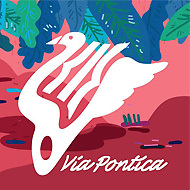 This name is a natural expression of the enthusiasm and dedication to chamber music performing as well as the willingness of the organizers to attract followers in their initiative. The first edition of the Festival is dedicated to the 70th anniversary of the end of the World War II. The program includes instrumental musical works as well as vocal ones. 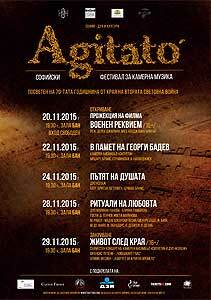 The organizer is "Sofia - spirit and culture" association. The project is supported by National fund "Culture". You can buy tickets online at www.ticketsbg.com; on the cash desk of Cantus Firmus ("Bulgaria" hall) and in front of the hall right before the concert. For more detailed information join our Facebook page, and you could look at the whole program of the festival here. 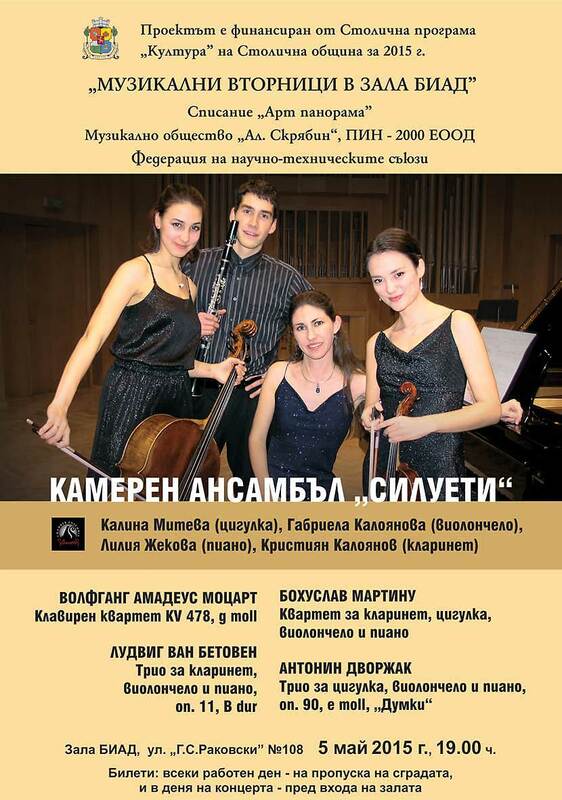 Concert in House of Culture "Iskar"
On October 20, 2015 at 18.30 in the concert hall of the House of Culture "Iskar" Chamber Ensemble "Silhouettes"
On September 18, 2015 at 7 pm in Cultural Center Palace – Stone Hall, a concert of Chamber Ensemble "Silhouettes" took place within the Eighth Festival of Youth Arts "Via Pontica" – Balchik. The program included two quartets by Wolfgang Amadeus Mozart and Bohuslav Martinu, as well as the musical tale "Peter and the Wolf" by Sergei Prokofiev together with the soprano Nadezhda Devedjieva in the role of the reader. 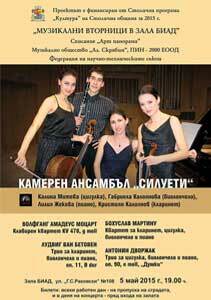 Programme: Wolfgang Amadeus Mozart – Piano Quartet in g moll, KV 478 KV; L. van Beethoven – Trio for clarinet, violoncello and piano, op. 11, B dur; Bohuslav Martinů – Quartet for clarinet, violin, violoncello and piano, H.315; Sergei Prokofiev – "Peter and the Wolf". The program of the festival could be found here. the musicians from Chamber ensemble "Silhouettes" presented to the audience four remarkable works from the classical repertoire. The performers thank all their friends and all fans of chamber music, to experience the wonderful moments together. The concert was a part of "Musical Tuesdays in BIAD Hall" series. It was organized with the kind support of Sofia municipal fund "Culture". TICKETS: every working day - at the porter's office of the building, and in the day of the concert - in front of the entrance of the hall. Ticket price: ordinary - 8 lv., for students and pensioners - 4 lv. Bohuslav Martinů – Quartet for clarinet, violin, violoncello and piano, H.315; Antonín Dvořák – Trio for violin, violoncello and piano, оp. 90, e moll, "Dumky". 15th March/17th March 2015 г. 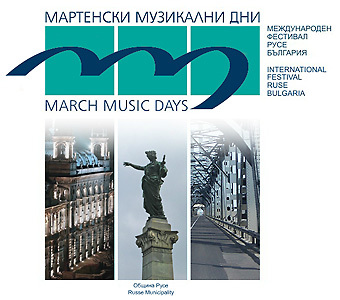 A. Schönberg - "Pierrot Lunaire" and Yordan Daffov - "The course of time"
On March 15, 2015 at 7 p.m. in "Europe" Hall, Rousse within the "March Music Days" International festival and on March 17, 2015 at 7.30 p.m. in Studio 1 in the Bulgarian National Radio, Sofia Chamber Ensemble "Silhouettes" together with prof. Ventseslav Nikolov (cello), Galia Simeonova (sopran), Natalia Afeyan (mezzosopran) and Alexander Djambazov (flute) presented to the audience "Pierrot Lunaire" of Arnold Schönberg and "The course of time" of Yordan Daffov (premiere). 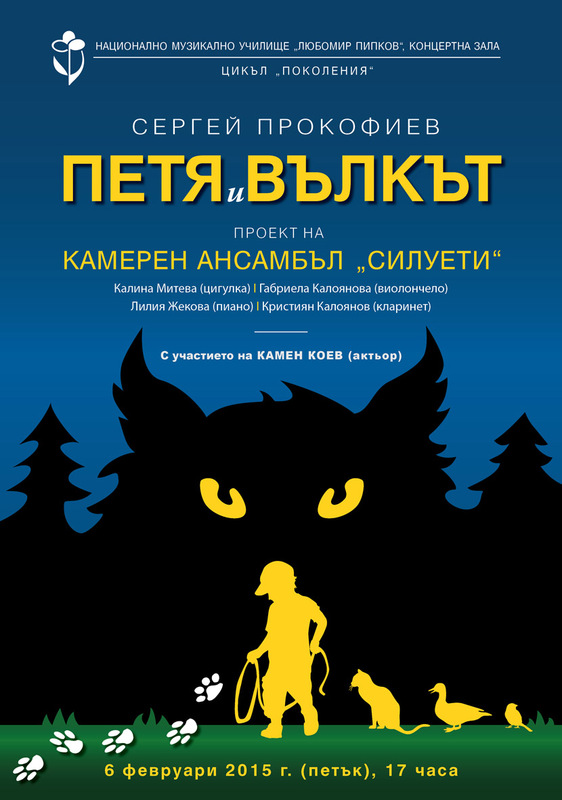 On February 6, 2015 at 5 p.m. Chamber Ensemble "Silhouettes" presented to the audience the beautiful musical tale for children "Peter and the Wolf" by Sergei Prokofiev in the hall of the National School of Music "Lyubomir Pipkov". 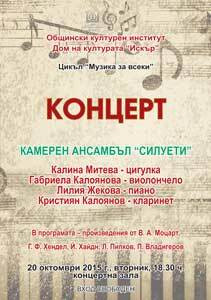 The work is arranged for violin, cello, clarinet and piano by Kristiyan Kaloyanov. The narrator's role is entrusted to the actor Kamen Koev. The concert was organized with the kind support of the National School of Music as a part of the "Generations" series. At the end of the 1930s the Russian composer Sergei Prokofiev created the symphonic work for children on behalf of the Central Children's Theatre in Moscow. He wrote the piece in just 4 days, as well as the text of the story. The premiere of "Peter and the Wolf" was on May 2, 1936, conducted by Prokofiev himself. The beautiful music and the accessible storyline quickly became one of the most popular and beloved works of our time.